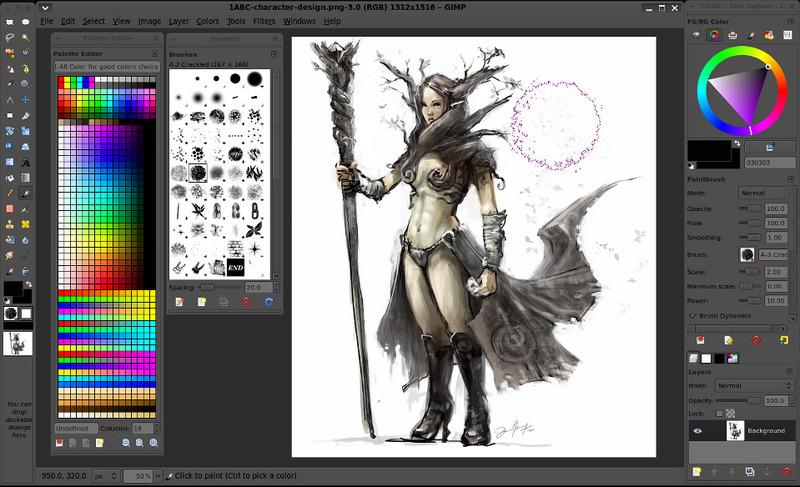 The brush-tip and pattern of Chaos&Evolutions were all merged in code of Gimp and Krita. This presets uses specifications of Gimp 2.6, not compatible with Gimp 2.8 and up. The Brush kit is designed for Gimp 2.6.x with the Patch Gimp-Painter. Save your presets before installing this one, or it will write over and erase your old existing presets (if you created somes). If the brush kit is successfully installed you should see the same splash at opening than in the screenshots. 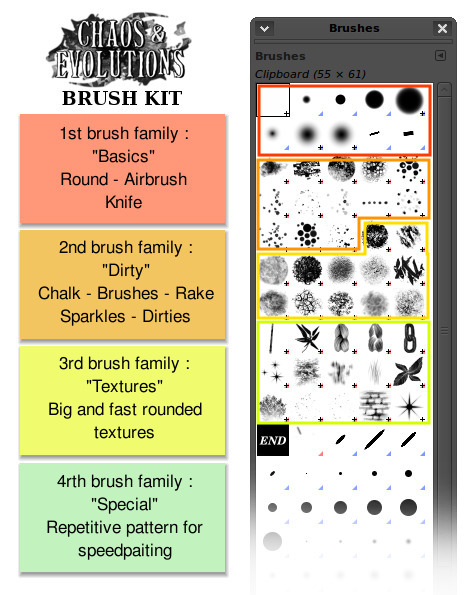 The "Chaos&Evolutions Brush Kit" install on your Gimp presets for various tool, palette and brushes. It's just a ready to use brush kit to do concept art, digital painting and computer art. Screenshots above can help you to understand how it works. My philosophy for the "Chaos&Evolutions Brush Kit" was to build a professional brush kit from the scratch for the open project "Chaos&Evolutions" and "Durian". I did some research on the brushes creation to find the best deal between detailed brushes for the painting and calculation speed for the brush engine. Many brush kit on internet are packs of "free" brushes took from various community artist that give brush with problem of licensing. Commons sources of brushes are : Deviant Art / Gnomon DVD / CGsociety / Personnal website / Blog and specialised website of *.abr brush. Those brushes can't be used on an open source project cause it's impossible to know where the brush come from. It can be from a copyrighted photo. It can be against the copyright of an artist. 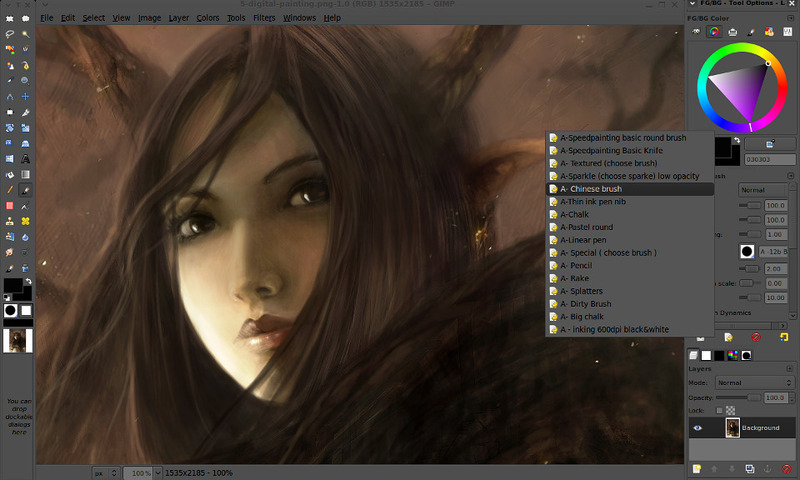 I hope this brushkit will help artist on Linux. I hope this brushkit will help open source 2D painting project, for developpers to analyse and to merge it in the codes and presets. For any questions, post a comment. mentioned at the end of the article, 18 march 2010 .
aww... I was hoping it was for photoshop, ah well, they look easy enough to make in photoshop anyway so I guess I'll do it myself. Love what I've seen so far. Can't wait to get this package. Really good Work David for Durian !! I'm waiting to find your DVD in my mailbox. I am a big fan of your work and your enthusiasm in helping people create better art. I am having difficulty understanding if it is possible to use Gimp-Painter on a Mac. I have searched the web and can't find much about this. Only windows. Do you have any links to where to download mac os x versions of these tools or do they not exist? Normally the website "http://gimp-painter.blogspot.com/" give a mac build, but it look down or broken since few days only. Too bad, first deadlink of the DVD. Thank you so much for providing this information. I installed the top link download from the author and your Durian hosted link. Both worked. I prefer the one on the Durian server as it is a later build. I also installed your brush kit. For Gimp Painter even though I have an iMac, I needed to follow the linux instructions i.e. I copied the files to my /Users/UserName/.gimp-2.6 folder. I did have a folder in Application Support/Gimp but that was used by the regular version of Gimp I had installed. I just purchased a new Wacom Intuos4 medium and am very keen to try it out with your DVD tutorials. Many thanks for the feedback Reece :) this is good to know the Mac package works and will be useful for many other users for sure. hej - my dvd arrived yesterday and I just wanted to thank you for this work. It's awesome! Hi Deevad !! Great Brushes !! I bought your DVD yesterday too ! 1 - In your screenshot, what is the name of your Gimp Theme ? 2 - Is it possible to you to post your windows-set for clean window position ? 3- All the brush have a name starting with 'A -' to not be mixed with the default brush. ( exept the 'Z-test pressure'. Gimp normaly organize brush by name. Good it work on mac ! Thank you for this information and brushes-love your artwork! I just installed the Gimp-painter patch, thank you for the instructions. I am wondering if the installation process is the same if you have GIMP with GPS added? Do they all work together? Will the brushes overwrite GPS presets? with which Gimp-Painter tools, can I have the even feeling ? I have the practice of Max, Maya, C4D and Zbrush : but the feeling with this Blender version is so great !! I think, I will test this open sources solutions with more interest now ! Cool that you shared those brushes with Krita. but even using the words "read more" for the link text provide better context (for robots and everyone else) than linking to the word "here". Hope this advice is useful to you, I'm sure your brushes will be of great use to many people. Thank you, great stuff. Love your work. Thanks for the brushes - and thanks for getting blender.org to put GimpPainter for Mac! and was very exited to start the workshop. But i have problems ... maybe you can help me. I work with a mac with snow leo. After copying gimp panter to the application folder it opens well with x11. i found on www. This one creates a folder for the brush kit. BUT in the tools palette aren't TWO brushers, only one. And after newstart theres no splash. But your new brushes are visible/usable. What can i do? hi, i tried what you did. The Linux way on the mac, cause i, like you, got no folder for gimp painter in my application support. But i cannot do myself a folder in USERS/USERNAME/.gimp-2.6 because its not allowed to name a folder starting with a dot. I get an error telling that filenames starting with a dot are reserved for the system. How did you exactly did it? Maybe you can explain me. I work with a Mac OSX 10.6.4 on a brand new mac mini 2.66 GHz Intel Core 2 Duo. i got it! I did it myself, and i write it for other mac-users getting in trouble like me. Thats an older one, than i had first. After installing it the first good sign : I had the TWO BRUSHES! And it did create a folder inside users/username/library/application support. Than, as you told, copying the brush tool kit content in this folder, restart the Gimp .... AND .. I got the splash! Yeah. @Uli : Good you found a way to install it :) I'm not an apple user and I would be lost to give you advice on it. I'm happy it work for you. All user have a great patience to take time to install this gimp-painter fork correctly ; but it worth the time spent on it. Thank you for providing such great brush set for GIMP! This is my main tool to paint nowadays. But I have a question, this might only happen in Windows. I installed your brush set successfully, but the order is not like in the screen shot. 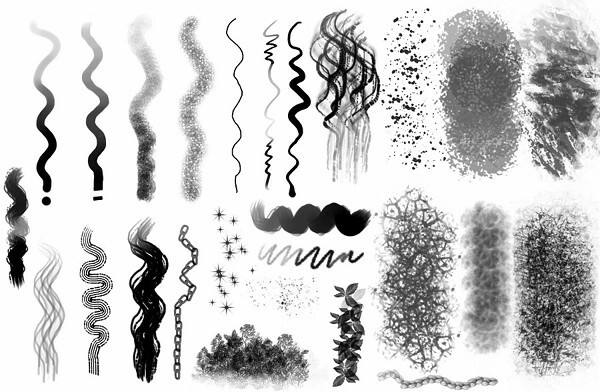 I tried to rename some brushes, some worked but the read-only ones would not let me do it. @Vibgyor: Hi ! 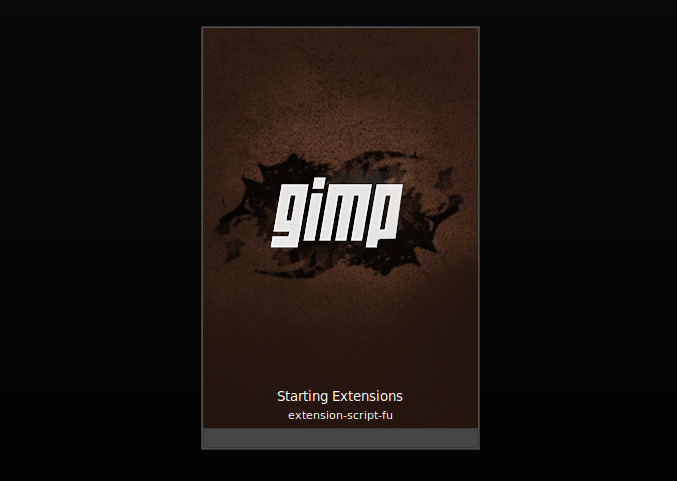 Nice to know you adopted Gimp as a main tool too :) The "read only brushes" belong to the default installed preset ; and can be found on the 'software installation directory'. On Windows, I guess it's "c/Program Files/GIMP/share/gimp/2.0/brushes" folder or something similar depending on your instalation and Gimp version. Here you can rename and clean if you want to keep only the needed ones. Now my Gimp looks anf feels fantastic. Thanks for putting this tutorial together. I really enjoy your work. I wanted to ask if the techniques and styling you are teaching could be used to create Blender animated movies that look like your paintings? Could you create textures/maps from these characters and backgrounds that would give a 3d movie a 2d/painted look? Another group of artists recently did something like that in "Meet Buck" - http://vimeo.com/17535548. I would be very excited if I could do something similar with Blender. Hi Zoren , thanks for the comment. Of course it's possible ; but it's a big work of concept-art and Uvmapping/texturing and render to match a 2D style. Once again, amazing brushes :) I wasn't really a Gimp fan, but I saw these brushes so I decided to install gimp-painter and I love it to death! These brushes are very useful! Thank you! Thank you David for the usefull brushes! @Sinatra and Stalcry : Thanks ! An update have been done of this kit, now merged in the last Gimp Paint Studio 1.5 ; I must do a blog post about. Yes, i ended up this way. If somebody need it too, just drop me a message. Thank you David, you are a great inspiration and your online participation is awesome, love your blog. Regards to France from Germany..
@gimpluver0011 : Use a file extractor. http://www.7-zip.org/ is compatible with windows. documentation on how to open a tar.gz is easy to find via google , btw. is 7zip a safe download ._. @gimpluver0011 : 7zip is safe. Keeping Windows installed is not. Hi! The download link for this brush set is broken. Do you have plans to fix it or have disabled the download for some reason? Thank you for your help, true the link was broken. It's not intentional. Hard to maintain blog post from 6 years ago ( the website had probably 4 big security update meanwhile ). Could you please upload the C&E kit with plugins? Could you please upload the whole C&E kit? Ooops, sry for double post.